Earn 4.5 SB per $ when you buy Barnes & Noble gift cards at MyGiftCardsPlus, powered by Swagbucks. 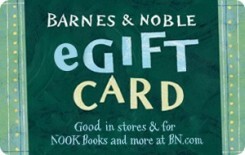 This Barnes & Noble eGift Card can be redeemed for NOOK Books and lots more at any Barnes & Noble store* and online at BN.com. *You must have ability to print certificate from your computer to use this eGift Card at a Barnes & Noble Store. Barnes & Noble eGift Cards can be redeemed at any Barnes & Noble store and online at BN.com (www.bn.com). Barnes & Noble eGift Cards may be used to purchase annual memberships in the Barnes & Noble Membership program (continuous billing memberships requires a valid credit card). Dormancy fees do not apply to balances on Barnes & Noble eGift Cards. The Barnes & Noble eGift Card will not be exchangeable for cash, except where required by law. BN.com will not be responsible for lost or stolen Barnes & Noble eGift Cards.